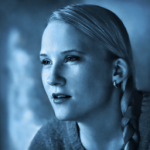 Written by Malin Hedström on March 17, 2015. As a civilian you made the most important decision of your life by enlisting in the HELLDIVERS. As a HELLDIVER you made Liberty… Democracy… and the protection of SUPER-EARTH your personal responsibility. But the war is still far from won… We need every woman, man and child to step up and preserve our hard-won ground and push out towards the home worlds of the alien races threatening us. To meet the alien threat, on March 17th we are deploying 3 DLC PACKS to any HELLDIVER in need of new outfits and gear. Each pack is available individually for $2.99 or you can buy all 3 Packs in the HELLDIVERS ADD-ON BUNDLE for $5.99 . The Commando Uniform (Helmet, Armor, and Cape). SMG-34 ‘Ninja’: A silenced, compact, submachine gun with short reach and good accuracy. The silenced aspect has been debated much and there is no proof that it actually reduces the risk of detection. MLS-4X ‘Commando’: A multiple missile launcher system similar to the one used on the EXO-44. From its four barrels it fires seeking missiles at a high rate of fire; primarily an anti-personnel weapon, it can be upgraded to have limited anti-tank capabilities. The Defender Uniform (Helmet, Armor, and Cape). CR-9 ‘Suppressor’: A semi-automatic rifle firing small fragmentation grenades. It is a volatile weapon but capable of devastating large masses of enemies, hence the nickname ‘Suppressor’. AD-334 ‘Guard Dog’: A backpack drone system, featuring an automated defensive combat drone armed with a small submachine gun. The drone circles ahead, firing at targets of opportunity and will land in the backpack to reload. 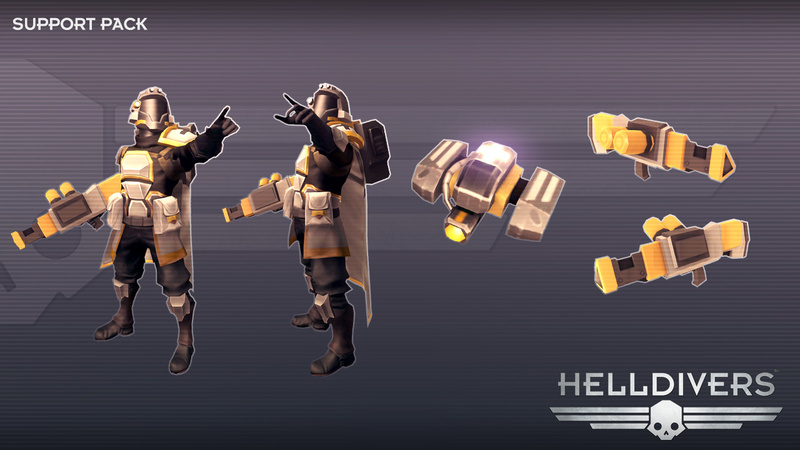 Support HELLDIVERS are much loved by their squad mates and bring both firepower and medical aid to any squad they join. Wearing the classic grey cape with a black cross they project an aura of capable concern for fellow humans. The Support Uniform (Helmet, Armor, and Cape). LAS-16 ‘Sickle’: A carbine based on laser technology, modified to behave more as a regular assault rifle. It overheats quickly but well placed shots do excellent damage and the virtually unlimited ammunition is invaluable in tight situations. AD-289 ‘Angel’: A backpack drone system, with an automated healing and repair drone that will try to help all friendly targets in its vicinity. It will land in the backpack to refill the restorative substance. Don’t forget the still ongoing Limited Edition bundle, until 4/28 (US, Asia). 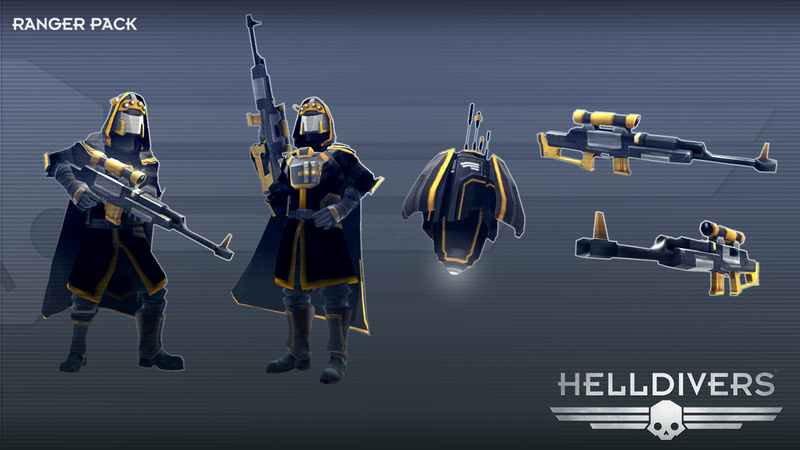 Citizens that enlist before this time will receive special HELLDIVERS Ranger training at no added cost. 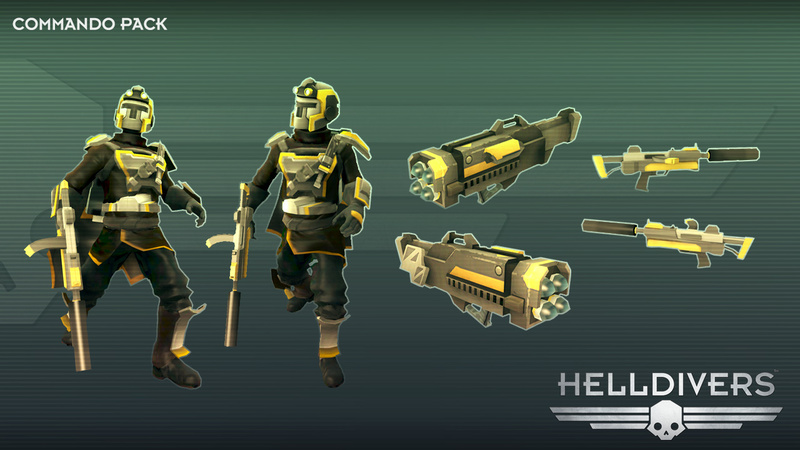 HELLDIVERS specially trained in scouting and assassination of high value targets, these Rangers are the first to drop into the unknown. 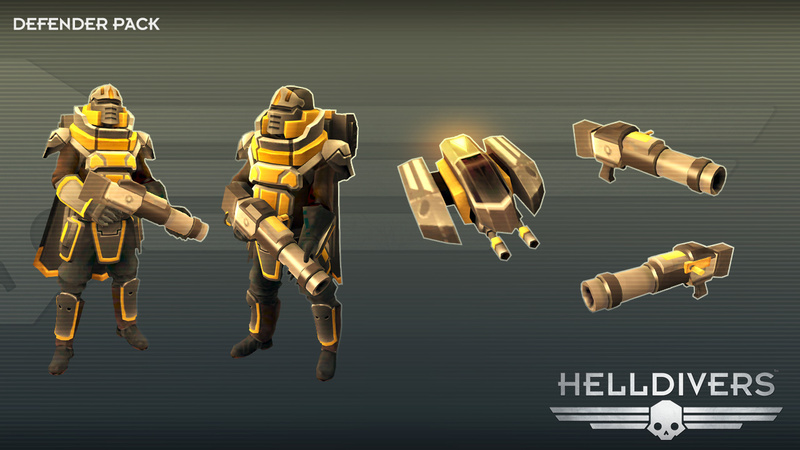 Ranger training was standard procedure for all HELLDIVERS in the early days of SUPER EARTH, but has now become rarer. The Ranger Uniform (Helmet, Armor, and Cape). LHO-63 ‘Camper’: A designated marksman rifle with high power and accuracy traded for fire rate, few enemies take more than a few shots to kill.